Steven Tyler worked very closely with Hohner to design the instrument to his exact specifications, in both looks and playability. His Signature Series harmonica features a custom combination of premium reed plates and silver styling. 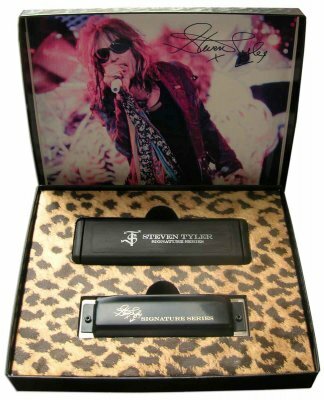 Packaged in a specially stylized gift box showcasing the harmonica (in the key of “A”), a black molded carrying case with custom artwork and signed photo of Steven Tyler. The perfect addition to any harmonica player’s collection! A limited number of these harmonicas have been manufactured and are currently being sold worldwide.